We’d love your help. 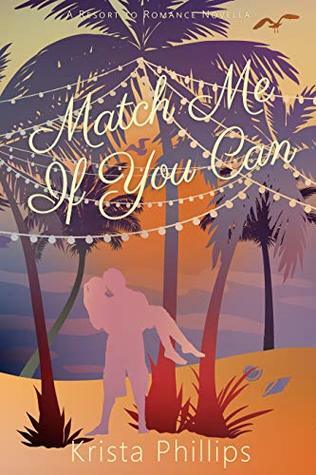 Let us know what’s wrong with this preview of Match Me If You Can by Krista Phillips. He was gifted a trip to the Bahama's Matchmakers week. She was conned into it. They're both determined to leave matchless. Ava Raleigh is going to strangle her best friend. Conned into going on a trip to the Bahamas for "Matchmaking" Week, Ava determines to everything she can to not be matched. She'd soak in the sun and enjoy every minute of her vacation--while completely ignoring whatever poor sap she gets matched with. What she doesn't expect is to be forced to spend time with her match. And the tiny fact that her match is a giant. Former NFL football player Sean Jackson is only on this trip because he loves his mother--nothing more. Sure, he feels guilty that some woman is paired with him and will be disappointed that he isn't interested--but that is bound to happen to most of the couples anyway, right? But he never expects a woman like Ava Raleigh. She is a puzzle--one he shouldn't want to put together but as the week goes on, he can't help himself. Ava refuses to fall for Sean. No way, not going to happen. He is all kinds of wrong for her. Not only is he out of her league, he also scares her more than a little. But as the week goes on, she comes to tolerate him--then even like him a little. Okay, fine, maybe a lot. To ask other readers questions about Match Me If You Can, please sign up. There are enough awkward situations to keep the lightheartedn Two people begrudgingly sent to matchmaking week on Joy Island are paired together. What are the odds? I liked that both Ava and Sean didn't want to go on a matchmaking vacation. It was fun to see them bicker at first. It was when real conversation took place that an actual relationship began. A huge misunderstanding breaks the trust between them. I can't say more without spoilers. This was a quick read and I enjoyed it. I really liked the faith elements in this novella. Here is yet another delightful novella in the series about matchmaking. Krista Phillips shows her humor and her precious love for the Lord here. I enjoyed it so much. Nothing amazing here. Tolerable characters and plot. Needed a bit of editing. She took the fairy... I think you mean ferry. Won't remember it long either. Very little memorable other than the mental picture of taking a "fairy". I always love Krista Phillips's books. She has a way of drawing me into a fun love story and then hitting me with a whole new kind of truth. With Ava and Sean, it was about fear... about overcoming the past... and the weighty topic of moving forward after trauma. It was all in a wonderful love story with a few twists I didn't see coming. Can't wait for the next one! This romance was a fun and short read about a match making week in the Bahamas. This is a clean read and will have you wanting to go to a tropical resort. *I was given a copy by the author. This is my honest opinion. Tricked into going to a matchmaking week makes the hero and heroine easy to cheer on. Enjoyed this novella. Perfect for when you need a quick happily ever after. Deals with some tough issues, but not in a heavy-handed it preachy way. Fun read with substance...had me in tears by the end. Im not a Christian and would have liked a little warning about that aspect of the book. I felt this book had potential but was cut short, especially the ending.